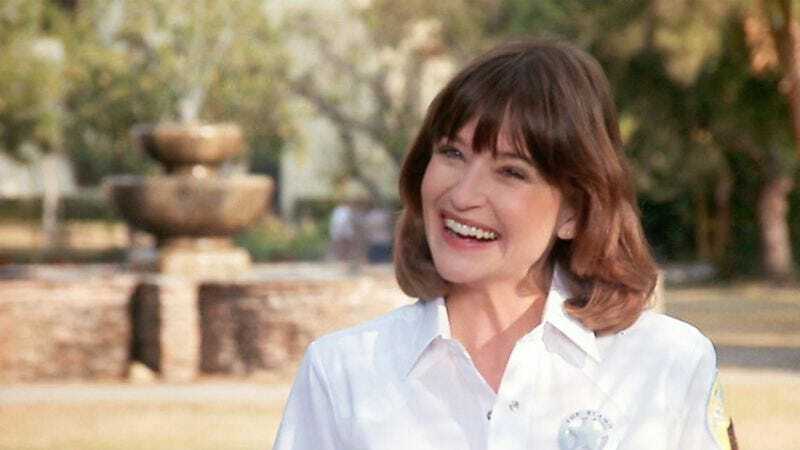 TMZ is reporting the death of Jan Hooks, who proved herself one of the most reliable cast members in Saturday Night Live’s history during her 1986 to 1991 run. Her agency has since confirmed it, though an official cause of death hasn’t been released; however, it’s reported that she was suffering from a serious illness. Hooks was 57. Like a lot of SNL players, Hooks got her training in the L.A. comedy troupe The Groundlings. After a brief television stint on HBO’s Not Necessarily The News, Hooks finally joined the late-night ensemble in 1986, during a year of merciless housecleaning. A newly reinstated Lorne Michaels had spent his first season back stocking the show with budding movie stars and established faces like Robert Downey Jr., Anthony Michael Hall, and Randy Quaid—as well as Joan Cusack, who took Hooks’ spot. After a mass culling that spared only Jon Lovitz, Dennis Miller, Nora Dunn, and A. Whitney Brown, Hooks joined the show’s twelfth season alongside newcomers Dana Carvey, Kevin Nealon, Victoria Jackson, and Phil Hartman. Quickly, they coalesced into arguably the strongest cast the show has ever seen. Though not a flashy breakout like Carvey or Miller, Hooks was—like Phil Hartman—a presence that elevated every sketch she was in. Her stable of memorable impressions included a perpetually weeping Tammy Faye Baker, a slinky, inappropriately seductive Diane Sawyer, and seemingly all the political women of the era: Nancy Reagan, Hillary Clinton, Kitty Dukakis. Her impression of Sinead O’Connor in the classic “Sinatra Group” is a great example of what Hooks could bring to a sketch, disappearing into the role and allowing Hartman to land his jabs, and getting laughs with nothing but a slow burn. Hooks was also well known for The Sweeney Sisters, a pair of obnoxious pop medley crooners she created alongside Nora Dunn. Their overenthusiastic scatting and cutesy, overly rehearsed patter became a mainstay of the show, and completely ruined “The Trolley Song” for everyone, forever. sweeney sisters christmas! from amy susanne on Vimeo. After leaving the show in 1991, amid another shift toward a cast dominated by Chris Farley, Adam Sandler et al., Hooks took over for Jean Smart on Designing Woman, serving on the show’s two final seasons. She would also take a recurring role on 3rd Rock From The Sun as Vicki Dubcek, embarking on a tempestuous romance with French Stewart’s alien. And she was Dixie, the alcoholic, completely out-of-it rock to Martin Short’s celebrity interviewer Jiminy Glick, appearing in several episodes of Primetime Glick and the movie Jiminy Glick in Lalawood. Though denied the movie career enjoyed by so many of her SNL colleagues, Hooks did have a few memorable roles—most notably as Tina, the perky, gum-chewing guide in Pee-wee’s Big Adventure, where she delivers the devastating news regarding the Alamo’s lack of a basement. Tim Burton would cast Hooks again in Batman Returns, where she played an image consultant tasked with making Danny DeVito’s Penguin look presentable (and avoiding his “French flipper trick”). Her other TV and movie appearances included roles in the films Coneheads, Simon Birch, and A Dangerous Woman. She could also be heard as the voice of Apu’s wife Manjula on six episodes of The Simpsons, and as the fembot Anglelyne who catches Bender’s eye in an episode of Futurama. Most recently, Hooks turned up on 30 Rock as Verna Maroney, the scheming mother to Jenna Maroney. Like her frequent partner and on-stage husband Phil Hartman, Hooks was often quietly great, a performer whose consistency may not have received all the accolades it deserved in its day, but whose death will certainly prompt a lot of belated recognition of how good she was. And suffice to say, losing her only makes watching Tom Schiller’s short “Love Is A Dream” all the more heart-wrenching.